Photo: (c) Steve Schapiro via Paramount Network TV Reviews I Am MLK Jr. In most faith traditions, there are two discernibly separate strands: the outward facing, community oriented ministers, priests, rabbis, mullahs and other leaders, and the contemplatives, the mystics, monks, bodhisattvas, hermits. Every now and then you get someone like Dr. Martin Luther King, Jr., who was both. King was not a politician, though he profoundly influenced the politics of his generation. Though he is sometimes referred to as the “final” Founding Father of the United States, he was not, at heart, a statesman. He was first, foremost and always a minister—one with a powerful, almost mesmerizing ability to sway people with words and who was unusually willing to walk as well as talk, and I mean that both literally and figuratively—the man donated the entirety of his Nobel Peace Prize to other civil rights activists. Today is the 50th anniversary of his murder in Memphis, Tenn, in remembrance of which Paramount Network/BET and award-winning producer Derik Murray are premiering a new documentary on his life and legacy. I Am MLK Jr tells the story and celebrates the life of this American icon in the context of contemporary civil rights politics. I Am MLK Jr. features interviews with civil rights-era activists including Rev. Jesse Jackson, Ambassador Andrew Young, Congressman John Lewis, and Rev. Al Sharpton, as well as contemporary writers, activists and influencers in sports, entertainment and media (Jones, Carmelo Anthony, Nick Cannon, Shaun King, Malcolm Jenkins) and more. Rich in archival footage and cast with a diverse array of commentators, the film is a wonderful mosaic of past and present, word and image, artfully shot and filled with wonderful vocal performances. I really appreciate the choice to intersperse the narrative with gospel choirs—it’s a lovely underscoring of what MLK’s story is largely about, which is the power of the human voice raised in a spirit of truth. I Am MLK Jr. is more than a biographical documentary: It is equally about the issues facing Dr. King that we still face today. 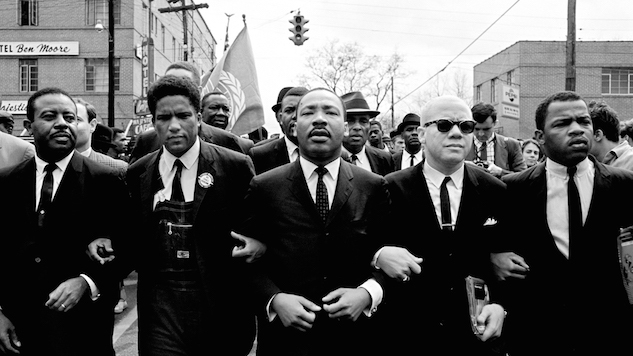 From Montgomery, Birmingham and Selma, King’s story stretches far past the end of his lifetime, and the film delves into contemporary examples: Ferguson, Mo., Charlottesville, Va., and the “take a knee” movement against police brutality. Yes, some things got better and some even stayed better, relatively speaking. A disturbing amount of argument and violence is ongoing over things that really haven’t changed at all, and this is where the film correctly suggests we must turn our eyes. Celebrating King’s life and work are easy. But honoring his legacy means doing a lot more of that work. It almost beggars belief that at the time of his assassination King was only 39 years old. Some people—not nearly enough of them—seem to possess a kind of ageless wisdom, and a rare few also have the oratory power to convey it to others. It’s hard to imagine what might have happened if we’d had him with us for the last 50 years. Maybe we’d be exactly where we are now, but I’d like to imagine the level of discourse around this country’s thorny, angry, fearful and dispiriting handling of racial equality and civil liberty would at least be a little higher. I Am MLK Jr. airs tonight at 9 p.m. on the Paramount Network and BET.